Fleet Sales See Continued Strength, Increase 16% in March - Cox Automotive Inc.
Like the used market, the new-vehicle market showed weakness in March. March new-vehicle sales were down 2.2% year-over-year, with one less selling day compared to March 2018. However, the March 2019 SAAR came in at 17.5 million, improving versus last year’s 17.2 million. Cars continue to see declines, as sales in March fell 7.9% compared to last year. Light trucks outperformed cars in March, finishing the month up 0.6% year-over-year. Combined rental, commercial, and government purchases of new vehicles were up 4.5% year-over-year in March, and up 16% month-over-month. 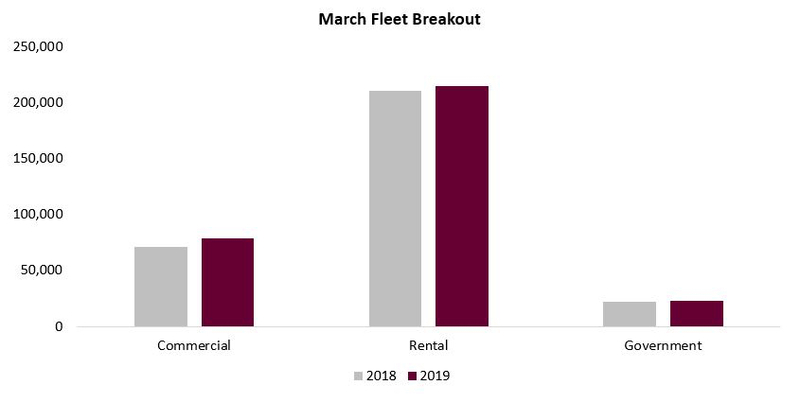 Rental (+2%), commercial (+11% ), and government (+7%) fleet channels were up year-over-year in March. New-vehicle retail sales were down 4% in March, leading to a retail SAAR of 14.0 million, down from 14.1 million last March.